Q: ‘It has been guesstimated that there are the remains of some six million woolly mammoths in the Arctic Circle alone. My neighbour states that it would be impossible for such a number to have multiplied in the approx. 1700 years from Creation to the Flood.’ — J.E. A: First, six million mammoths is hugely exaggerated. There are fewer than 50 known woolly mammoth carcasses, only about a half-dozen of which were complete. An estimated 50,000 tusks have been found, although there may have been a million mammoths living at one time. Third, the large numbers are a problem for the sceptic only because he has not performed the simple calculations required. Consider that the African elephant reaches breeding age at about 14, and its gestation period averages 670 days, while the Indian elephant matures even earlier and has a shorter gestation time.2 Thus it would not be unrealistic to assume that a single mammoth pair could have four offspring by the age of 25. So it is actually generous to the sceptic to assume that the population could double four times per century (even if the parents in each generation died soon after their offspring were weaned). The mammoths would probably have multiplied quite quickly after the single mammoth pair3 disembarked from the Ark, since there was less competition around. It takes only 22 population doublings to exceed eight million, and this number could be reached in only 550 years. This is explained in the children’s book Life in the Great Ice Age by Michael and Beverly Oard, and Michael’s more technical book An Ice Age Caused by the Genesis Flood. 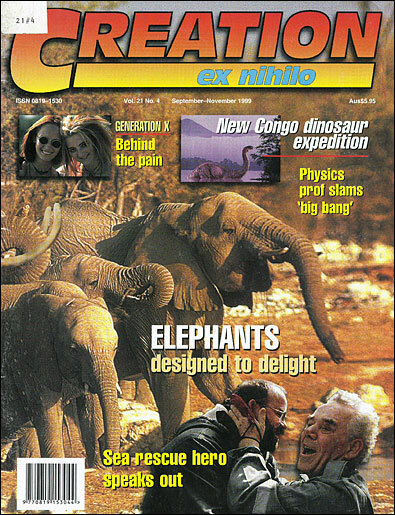 See also Tackling the big freeze, Creation 19(1):42–43, 1996. ‘Elephant’, Encyclopædia Britannica, 4:441–442, 15th Ed. 1992. This assumes that representatives of every genus of land vertebrate were on board the Ark — see Woodmorappe, J., Noah’s Ark: a Feasibility Study, Institute for Creation Research, El Cajon, CA, USA, 1996. But it’s likely that mammoths, mastodons, stegodons and modern elephants descended from a created elephantine kind.